The other day I picked up some beautiful pork chops from a local butcher. What instantly came to mind was a simple pan seared pork chop with applesauce on the side. To me this is a classic diner dish, one of those blue plate specials that made it into the permanent "special dinners" section of many greek-owned family diners you see in Chicago. I made a twist on this classic by creating a savory sweet apple chutney to go with a ginger-garlic pork chop. As an additional side I made roasted carrots. 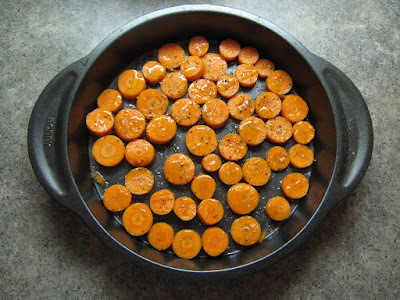 I began by washing a few carrots and cutting into thin slices. I arranged the carrot slices in a small baking dish, drizzled with olive oil and added salt and pepper. I placed the carrots in a 375 degree oven for about 20 minutes. I chose to keep the pork chop simple by searing it and finishing it in the oven. I brushed the pork chops with olive oil and sprinkled with salt and pepper. I placed the pork chops in a very hot cast iron skillet, flipping after a couple of minutes and placed in a 375 degree oven for about 5 more minutes until the pork was cooked through and slightly pink in the middle. Once out of the oven, I added a pad of butter to the pan, grated ginger, garlic, and serrano chile and spooned the combination over the pork chops, making sure to cover it in all the flavors. I set the pork chop to the side. 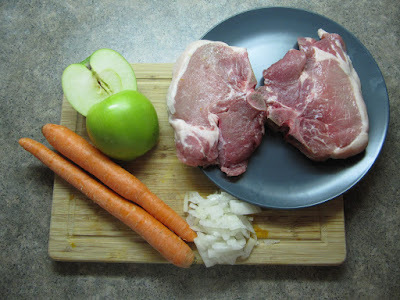 In the same pan that I used to cook the pork chop on medium heat, I added thinly sliced onion and a couple of cups of granny smith apples, cut into chunks. I used the left over garlic, ginger, chile and porky bits in the pan to flavor the apples. After sauteeing for a couple of minutes I deglazed the pan with a shot of whisky to pick up all the flavors and have everything come together. I added to the apples cinnamon, cardomom and brown sugar to sweeten them up a bit. I didn't cook the apples too long because I wanted them to maintain some texture. 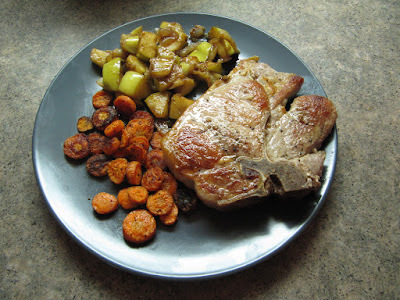 This dinner tasted very much like the classic pork chop and applesauce dinner but with a few changes to keep it interesting and to spice it up a bit. This is a relatively quick and easy dinner to make and various vegetables can be substituted for the carrots, but I would not replace the applesauce. Using a brush, coat the outside of the pork chops with olive oil, then season with salt and pepper. Place the pork chops in a very hot cast iron skillet and sear for 3 minutes. Flip the pork chops and transfer to a 375 degree oven for about 5 minutes or until the pork chop is cooked through and slightly pink in the middle. Move the skillet back to the stove top and add butter, ginger, garlic and serrano chile. Using a spoon or a brush, coat both sides in the butter mixture for a couple of minutes, making sure the pork chops are completely covered and set them aside. Using the same skillet on medium, add the onion and apples, add a shot of whisky to deglaze the pan. Add the cardamom, cinnamon, and brown sugar, continue to cook for about 5 minutes until the apples begin to soften. Once the apples are cooked, they are ready to serve alongside the pork chop.